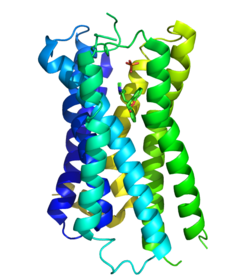 The H1 receptor is a histamine receptor belonging to the family of rhodopsin-like G-protein-coupled receptors. This receptor is activated by the biogenic amine histamine. It is expressed in smooth muscles, on vascular endothelial cells, in the heart, and in the central nervous system. The H1 receptor is linked to an intracellular G-protein (Gq) that activates phospholipase C and the inositol triphosphate (IP3) signalling pathway. Antihistamines, which act on this receptor, are used as anti-allergy drugs. The crystal structure of the receptor has been determined (shown on the right) and used to discover new histamine H1 receptor ligands in structure-based virtual screening studies. The expression of NF-κB, the transcription factor that regulates inflammatory processes, is promoted by the constitutive activity of the H1 receptor as well as by agonists that bind at the receptor. H1-antihistamines have been shown to attenuate NF-κB expression and mitigate certain inflammatory processes in associated cells. Histamine H1 receptors are activated by endogenous histamine, which is released by neurons that have their cell bodies in the tuberomammillary nucleus of the hypothalamus. The histaminergic neurons of the tuberomammillary nucleus become active during the ‘wake’ cycle, firing at approximately 2 Hz; during slow wave sleep, this firing rate drops to approximately 0.5 Hz. Finally, during REM sleep, histaminergic neurons stop firing altogether. It has been reported that histaminergic neurons have the most wake-selective firing pattern of all known neuronal types. The tuberomammillary nucleus is a histaminergic nucleus that strongly regulates the sleep-wake cycle. H1–antihistamines that cross the blood-brain barrier inhibit H1 receptor activity on neurons that project from the tuberomammillary nucleus. This action is responsible for the drowsiness effect associated with these drugs. ^ Shimamura T, Shiroishi M, Weyand S, Tsujimoto H, Winter G, Katritch V, Abagyan R, Cherezov V, Liu W, Han GW, Kobayashi T, Stevens RC, Iwata S (Jul 2011). “Structure of the human histamine H1 receptor complex with doxepin”. Nature. 475 (7354): 65–70. doi:10.1038/nature10236. PMC 3131495. PMID 21697825. ^ de Graaf C, Kooistra AJ, Vischer HF, Katritch V, Kuijer M, Shiroishi M, Iwata S, Shimamura T, Stevens RC, de Esch IJ, Leurs R (Dec 2011). “Crystal structure-based virtual screening for fragment-like ligands of the human histamine H(1) receptor”. Journal of Medicinal Chemistry. 54 (23): 8195–206. doi:10.1021/jm2011589. PMC 3228891. PMID 22007643. ^ Passani MB, Lin JS, Hancock A, Crochet S, Blandina P (Dec 2004). “The histamine H3 receptor as a novel therapeutic target for cognitive and sleep disorders”. Trends in Pharmacological Sciences. 25 (12): 618–25. doi:10.1016/j.tips.2004.10.003. PMID 15530639. ^ Malenka RC, Nestler EJ, Hyman SE (2009). “Chapter 6: Widely Projecting Systems: Monoamines, Acetylcholine, and Orexin”. In Sydor A, Brown RY (eds.). Molecular Neuropharmacology: A Foundation for Clinical Neuroscience (2nd ed.). New York: McGraw-Hill Medical. pp. 175–176. ISBN 9780071481274. Within the brain, histamine is synthesized exclusively by neurons with their cell bodies in the tuberomammillary nucleus (TMN) that lies within the posterior hypothalamus. There are approximately 64000 histaminergic neurons per side in humans. These cells project throughout the brain and spinal cord. Areas that receive especially dense projections include the cerebral cortex, hippocampus, neostriatum, nucleus accumbens, amygdala, and hypothalamus. … While the best characterized function of the histamine system in the brain is regulation of sleep and arousal, histamine is also involved in learning and memory … It also appears that histamine is involved in the regulation of feeding and energy balance. Mitsuchashi M, Payan DG (Jun 1989). “Molecular and cellular analysis of histamine H1 receptors on cultured smooth muscle cells”. Journal of Cellular Biochemistry. 40 (2): 183–92. doi:10.1002/jcb.240400207. PMID 2670975. Braman SS (1987). “Histamine receptors in the lung”. New England and Regional Allergy Proceedings. 8 (2): 116–20. doi:10.2500/108854187778994446. PMID 2886904. Hill SJ, Ganellin CR, Timmerman H, Schwartz JC, Shankley NP, Young JM, Schunack W, Levi R, Haas HL (Sep 1997). “International Union of Pharmacology. XIII. Classification of histamine receptors”. Pharmacological Reviews. 49 (3): 253–78. PMID 9311023. Holden CA, Chan SC, Norris S, Hanifin JM (Oct 1987). “Histamine induced elevation of cyclic AMP phosphodiesterase activity in human monocytes”. Agents and Actions. 22 (1–2): 36–42. doi:10.1007/BF01968814. PMID 2891264. Moguilevsky N, Varsalona F, Noyer M, Gillard M, Guillaume JP, Garcia L, Szpirer C, Szpirer J, Bollen A (Sep 1994). “Stable expression of human H1-histamine-receptor cDNA in Chinese hamster ovary cells. Pharmacological characterisation of the protein, tissue distribution of messenger RNA and chromosomal localisation of the gene”. European Journal of Biochemistry / FEBS. 224 (2): 489–95. doi:10.1111/j.1432-1033.1994.00489.x. PMID 7925364. Fukui H, Fujimoto K, Mizuguchi H, Sakamoto K, Horio Y, Takai S, Yamada K, Ito S (Jun 1994). “Molecular cloning of the human histamine H1 receptor gene”. Biochemical and Biophysical Research Communications. 201 (2): 894–901. doi:10.1006/bbrc.1994.1786. PMID 8003029. Le Coniat M, Traiffort E, Ruat M, Arrang JM, Berger R (Aug 1994). “Chromosomal localization of the human histamine H1-receptor gene”. Human Genetics. 94 (2): 186–8. doi:10.1007/bf00202867. PMID 8045566. De Backer MD, Gommeren W, Moereels H, Nobels G, Van Gompel P, Leysen JE, Luyten WH (Dec 1993). “Genomic cloning, heterologous expression and pharmacological characterization of a human histamine H1 receptor”. Biochemical and Biophysical Research Communications. 197 (3): 1601–8. doi:10.1006/bbrc.1993.2662. PMID 8280179. Hishinuma S, Young JM (Nov 1995). “Characteristics of the binding of [3H]-mepyramine to intact human U373 MG astrocytoma cells: evidence for histamine-induced H1-receptor internalisation”. British Journal of Pharmacology. 116 (6): 2715–23. doi:10.1111/j.1476-5381.1995.tb17232.x. PMC 1909113. PMID 8590995. Max SI, Chowdhury BA, Fraser CM (Jun 1996). 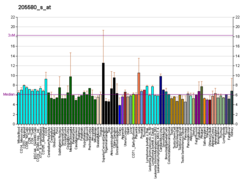 “Sequence analysis of the 5′-untranslated region of the human H1 histamine receptor-encoding gene”. Gene. 171 (2): 309–10. doi:10.1016/0378-1119(96)00036-4. PMID 8666296. De Backer MD, Loonen I, Verhasselt P, Neefs JM, Luyten WH (Nov 1998). “Structure of the human histamine H1 receptor gene”. The Biochemical Journal. 335 (3): 663–70. doi:10.1042/bj3350663. PMC 1219830. PMID 9794809. Horváth BV, Szalai C, Mándi Y, László V, Radvány Z, Darvas Z, Falus A (Nov 1999). “Histamine and histamine-receptor antagonists modify gene expression and biosynthesis of interferon gamma in peripheral human blood mononuclear cells and in CD19-depleted cell subsets”. Immunology Letters. 70 (2): 95–9. doi:10.1016/S0165-2478(99)00126-1. PMID 10569698. Wang KY, Arima N, Higuchi S, Shimajiri S, Tanimoto A, Murata Y, Hamada T, Sasaguri Y (May 2000). “Switch of histamine receptor expression from H2 to H1 during differentiation of monocytes into macrophages”. FEBS Letters. 473 (3): 345–8. doi:10.1016/S0014-5793(00)01560-X. PMID 10818238. Oda T, Morikawa N, Saito Y, Masuho Y, Matsumoto S (Nov 2000). “Molecular cloning and characterization of a novel type of histamine receptor preferentially expressed in leukocytes”. The Journal of Biological Chemistry. 275 (47): 36781–6. doi:10.1074/jbc.M006480200. PMID 10973974. Brew OB, Sullivan MH (Sep 2001). “Localisation of mRNAs for diamine oxidase and histamine receptors H1 and H2, at the feto-maternal interface of human pregnancy”. Inflammation Research. 50 (9): 449–52. doi:10.1007/PL00000269. PMID 11603849. Gutzmer R, Langer K, Lisewski M, Mommert S, Rieckborn D, Kapp A, Werfel T (Mar 2002). “Expression and function of histamine receptors 1 and 2 on human monocyte-derived dendritic cells”. The Journal of Allergy and Clinical Immunology. 109 (3): 524–31. doi:10.1067/mai.2002.121944. PMID 11898002. Idzko M, la Sala A, Ferrari D, Panther E, Herouy Y, Dichmann S, Mockenhaupt M, Di Virgilio F, Girolomoni G, Norgauer J (May 2002). “Expression and function of histamine receptors in human monocyte-derived dendritic cells”. The Journal of Allergy and Clinical Immunology. 109 (5): 839–46. doi:10.1067/mai.2002.124044. PMID 11994709. “Histamine Receptors: H1“. IUPHAR Database of Receptors and Ion Channels. International Union of Basic and Clinical Pharmacology.